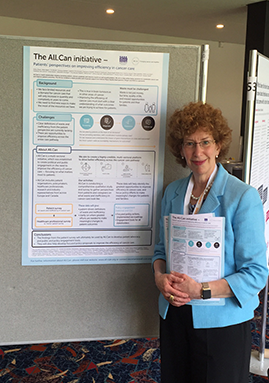 All.Can member Kathy Oliver shared a poster at the annual British Neuro-Oncology Society (BNOS) conference in Edinburgh on 21 June. Kathy, who is founding Co-Director and Chair of the International Brain Tumour Alliance (IBTA), shared the poster on behalf of the All.Can initiative during the conference’s Patient Advocacy Lounge poster exhibition. The poster showcased some of the findings from the policy report. It also highlighted future research projects that plan to capture the patient perspective on how to improve efficiency in cancer case and eliminate waste. All.Can’s early work found that the patient perspective was often not considered in the planning, evaluation and delivery of cancer care. In addition, there is a dearth of data on patients’ perceptions of inefficiency in cancer care. BNOS is a multidisciplinary organisation that promotes research and education in the field of neuro-oncology, with the aim of improving treatment and management of patients with central nervous system tumours. The conference was attended by a range of healthcare professionals, patient advocacy groups and representatives from the commercial sector.